What happens when elegant engineering collides with cutting edge medical science? The answer lies in a tiny device – a device that will one day allow paraplegics to move with the power of thought. Smaller than a paperclip, this device is implanted into a blood vessel next to the brain’s motor cortex. And what it does next is extraordinary. The inventors call it a stentrode. Once implanted, it picks up signals that would normally be sent to a person’s limbs to create movement. Instead, the signal will be sent to a computer, which will then transmit it to a robotic exoskeleton attached to the person’s limbs. The stentrode can record brain signals from within a blood vessel next to the brain. All the patient will have to do is think about it. This notion of wirelessly thought-controlled limbs is possible thanks to a collaboration of 39 brilliant minds from 16 departments across the University of Melbourne’s medicine, science and engineering faculties. After initial proof-of-concept research demonstrated the capability of the device to pick up neural signals that could be used to control external equipment, the device is now being optimised and enhanced by the team at the University of Melbourne, Royal Melbourne Hospital and the Florey Institute of Neuroscience and Mental Health. 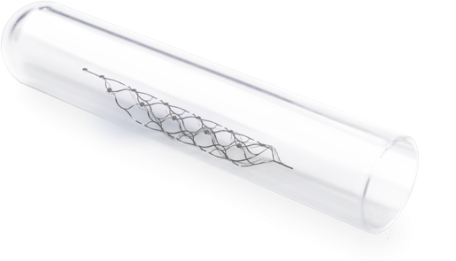 In early 2018, a select group of paralysed patients in Australia will be chosen for the trial, where they will be implanted with the stentrode. If the trial is successful, they anticipate that the technology could become commercially available in as little as six years. 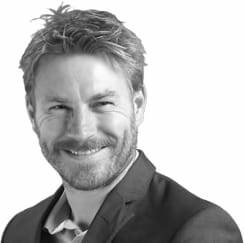 The chief engineer behind the device is the University of Melbourne’s Dr Nick Opie, a senior research fellow and co-head of the Vascular Bionics Laboratory at the Royal Melbourne Hospital. An exoskeleton, similar to this one, will be used by patients implanted with a stentrode. Dr Opie was recruited from the bionic eye project. “I’ve always been fascinated by the integration of man and machine and the ways that people and machines could function together. Fortunately, I was born in the time to do this,” Dr Opie says. Dr Opie and his team produced the winning design using a flexible material called nitinol, also used in bra underwires, modern glasses frames, orthodontics and bone screws. It is fitted with tiny recording discs, called electrodes, which sit on the wall of the blood vessel, right next to the brain tissue. Each disc records electrical activity fired by some 10,000 neurons, which is delivered via delicate wires that run out of the brain, into the neck and emerge into the chest into a wireless transmission system. After a period of training the brain remembers what to do and the thoughts become second nature. Dr Nick Opie, chief engineer behind the stentrode. 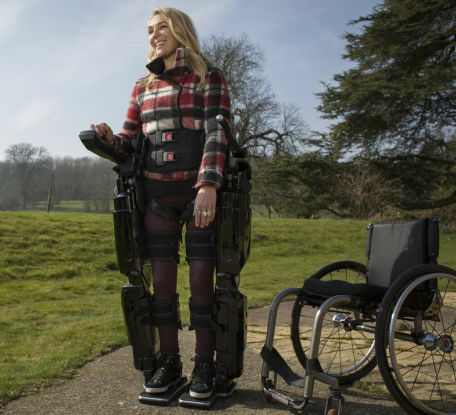 The first patients will most likely be young people who have suffered a traumatic spinal cord injury around six months to a year earlier, who are suitable for exoskeleton legs. They will be chosen for their level of determination, their resolve and their physiology, Dr Opie – who will be there to guide the patients through the arduous journey – says. “Much like learning to drive a manual car, play an instrument or type on a keyboard, after a period of training the brain remembers what to do and the thoughts become second nature. This is what we expect will happen when people use our device to command wheelchairs, exoskeletons and prosthetic limbs,” Dr Opie says. Since the announcement of the successful testing of the device in February 2016, the team has been working with manufacturing groups in Germany and in the USA who will be making the devices in internationally certified and FDA approved clean-rooms. They have also been working with engineers to further develop the stentrode so it can provide an alternative treatment for other neurological conditions, including the detection and suppression of epileptic seizures, minimally invasive deep-brain stimulation for Parkinson’s tremor and even highly focussed neural stimulation to treat depression and post-traumatic stress disorder. And the researchers are working towards securing ethical approvals for the first human trial, which, if all goes well, will be expanded to a global trial. What happens next, one way or another, will make history. This work was funded by DARPA, the NHMRC, the US Department of Defense, US Office of Naval Research Global, the Australian Defence Health Foundation, the Brain Foundation.